The amount of money raised by candidates in the Texas senate race has now been reported, and it shows that Democrats are indeed energized this year. They think they have a real chance of kicking Ted Cruz out of the U.S. Senate, and they are donating big to his opponent's campaign. Democrat Beto O'Rourke raised more than twice as much as Cruz did in the first quarter of this year. 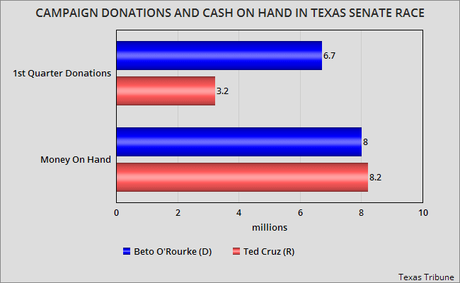 O'Rourke raised $6.7 million, while Cruz raised only $3.2 million. And O'Rouke's money came only from voters. He took no money from PAC's or super-PAC's. Cruz raised only $2.7 million from voters. The rest came from his "leadership PAC". Thanks to the great first quarter, it looks like O'Rourke is going to have the money to wage a good campaign against Cruz. Cruz reports $8.2 million in on-hand money, while O'Rourke reports slightly over $8 million. This is great news. In the past, Democratic statewide candidates have been vastly underfunded, and their opponents were able to easily outspend them. That's not the case in the Texas senate race this year!